Young rider Kyle Perkovich racks up his second win in the 1.30m Grand Prix. 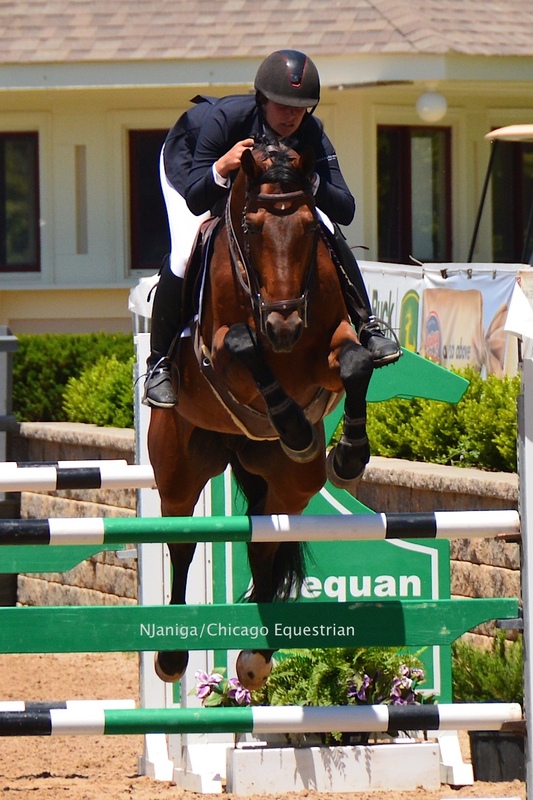 Photo Nicole Janiga/Chicago Equestrian. 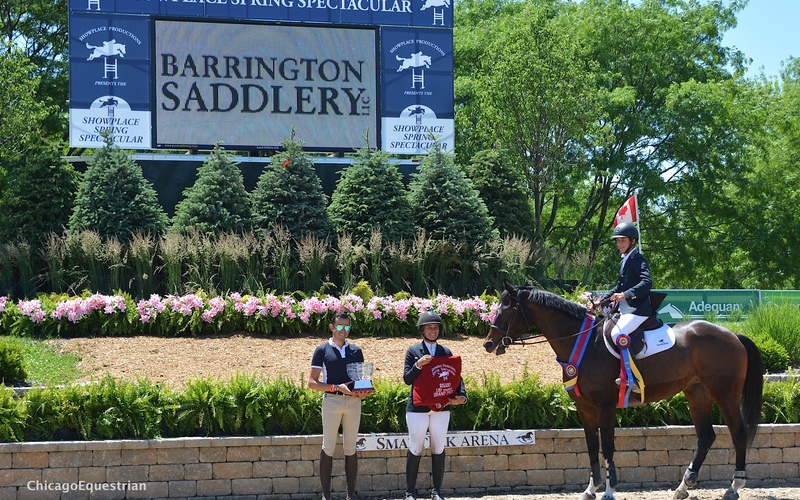 Wayne, IL - June 17, 2016 – Week two of Showplace Productions’ Spring Spectacular featured the $15,000 1.30m Marshall and Sterling Grand Prix, presented by Barrington Saddlery, as part of the $150,000 Marshall and Sterling Grand Prix Series, which will run at all Showplace Productions Shows through August. Young riders took control of a field of 50 entries including professionals, amateurs and juniors to lead this week’s prix. The top three spots were taken by emerging riders getting their game, as last week’s winner, 14-year-old Kyle Perkovich, Long Grove, Illinois, returned with his speedy Roc My World, to take the top honors once again. Claire McKean, 18, of Woodlands, Texas, took the 2nd place spot aboard Elektro and 14-year-old Caelinn Leahy took third. McKean just finished high school and both Perkovich and Leahy will be freshmen in high school this fall while, trying their hand at bigger classes to gain more experience. The Anderson Lima designed track proved rough for all riders, with only 19 of the 50 entered returning for the jump-off. Leahy held the lead through most of the class, delivering the first double clear ride aboard her own, Tzargazer with a speedy time of 35.97. Leahy was over taken by Claire McKean and Elektro, who were two tenths of a second faster with a time of 35.693. McKean held the top spot until Perkovich came back for his shot at the jump off, where he delivered a blazing round of 32.556 to stop the clock. Perkovich showing his tidy turns and quick gallop, learned from trainer Lisa Goldman. The key for Perkovich has been getting more chances to ride horses at home and getting more time in the saddle. The chance to follow in his mentor’s footsteps and ride for the U.S. team has also motivated Perkovich. 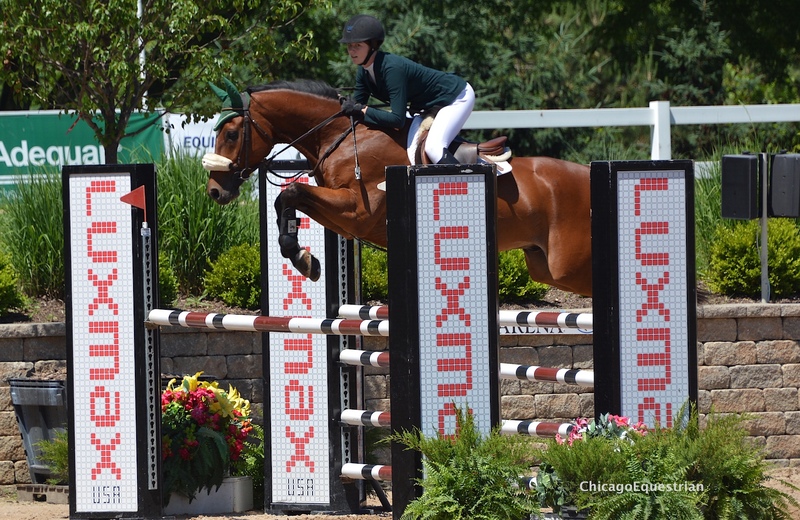 Just this week, USEF announced that Goldman would be part of 2016 United States Equestrian Federation (USEF) Show Jumping Development Tour, traveling to Europe in July to compete. “I knew she qualified which is awesome, it’s pretty cool, I would love to do that someday if I can,” stated Perkovich. Every part of Perkovich’s strategy evolved to fit his horse Roc My World, to help the mare in the jump-off. “My plan was to do seven up the first line to make up time, I knew my speed would take me out and around so I made sure I was tidy, I tried to make sure I was careful going to the in-and-out, I heard my trainer say ‘whoa’ so I slowed down, and heading to the last fence I made sure to slice the fence to head straight through the timers,” explained Perkovich. “My goal every time I step in the ring is to just do my best and go clean,” said a smiling Perkovich. Leahy, Maple Park, Illinois, was coming off a win in the $10,000 High Junior/AO Jumper Classic and a fifth place finish in the $30,000 Marshall and Sterling Grand Prix during week one of Showplace Spring Spectacular, tried out the series for the first time this week. “I think it’s really cool. It’s my first time showing in it but I’ve kept up with it. In this class you have everybody, professionals, amateurs, juniors, so it’s fun to mix up the playing field. It feels great, it’s awesome, that a lot of people I look up to as riders I get to compete against,” said Leahy. Claire McKean, 18, of Woodlands, Texas, took the 2nd place spot aboard Elektro. Instead of waiting for the results, Leahy immediately went back to the barn and started hacking horses and even took a lesson with trainer Steve Schaefer, of Bellis Show Jumping. This also demonstrates Leahy’s love for being in the saddle, one of the reasons she’s moving up the ladder quickly. For both Leahy and Perkovich, time in the saddle has made a big difference. Throw in wonderful mounts and top training and there’s the mix for success. On top of gaining more experience, the leading horse and rider of the series receive a $10,000 bonus, which will be presented at the Showplace Fall Classic, but neither Perkovich nor Leahy are absolutely sure what they would do with it. “I’m not really sure what I would do with it, probably put it towards the horses, I’m not sure though,” joked Leahy. Perkovich had a similar response. “I don’t know, probably savings,” affirmed Perkovich, after being coached by his father from the sidelines! Christopher Ferralez presents for Barrington Saddlery. The $150,000 Marshall and Sterling 1.30 Grand Prix Series will continue next week at Showplace Productions Spring Spectacular. 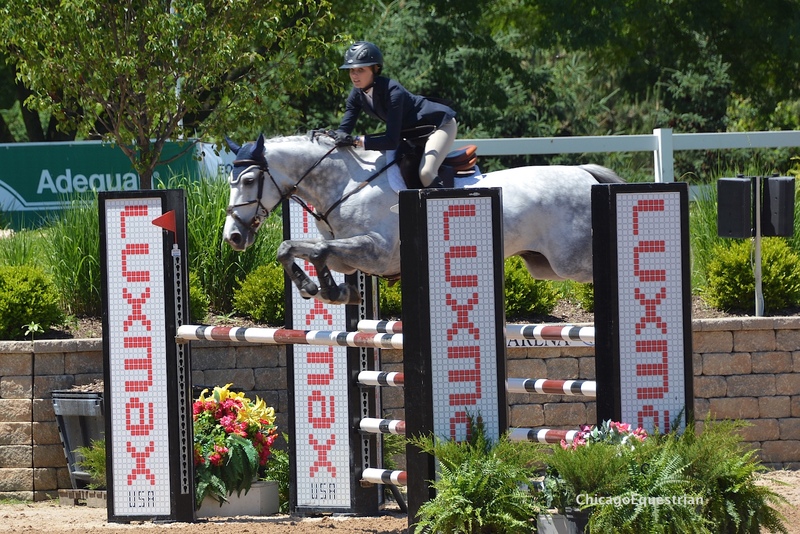 Also up for grabs in the series is a CWD saddle, which will go the leading rider and a $5,000 gift voucher from Devocoux, which will go the leading trainer. 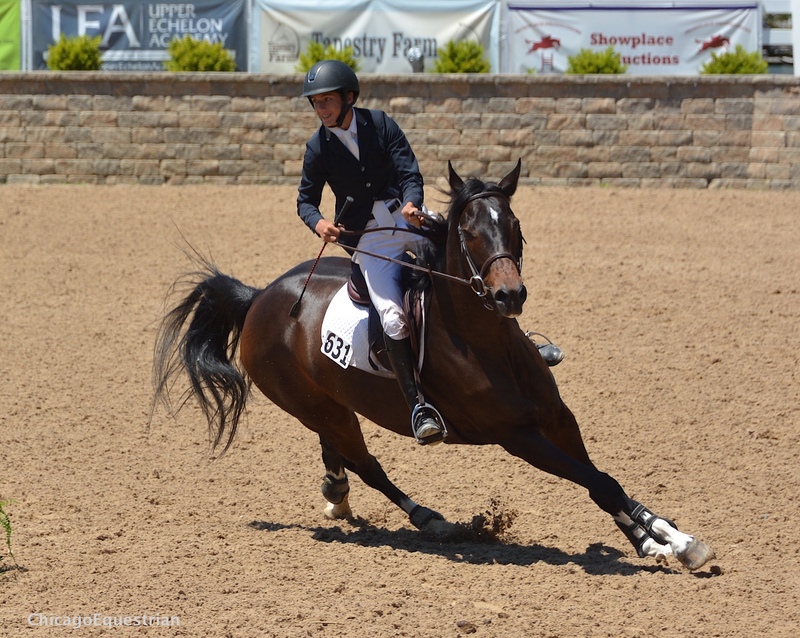 Showplace Productions Spring Spectacular will continue Saturday, June 17, with the $40,000 Adequan Grand Prix. For more information visit www.showplaceproductions.com.